Learning the Bunny Hop dance is quick and easy; it's so easy in fact that many people learn it on the spot during wedding receptions or company parties. With a name like the Bunny Hop, it would be difficult to take this dance too seriously. While the Bunny Hop is usually the most fun if there are dancers of all ages on the dance floor, children can do this dance alone. No matter how many left feet you have, this dance is quickly learned and easily executed. Young children and their (great)-grandparents even get in on the fun of doing the Bunny Hop. At wedding receptions the DJ will often invite all of the children present to come to the dance floor before starting the music to the Bunny Hop. 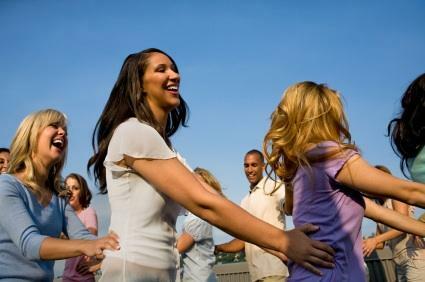 The DJ will also often demonstrate the dance and make sure that everybody is doing it before starting the music. Alternatively, he might designate a few people from the wedding party to demonstrate the steps and get as many guests involved as possible. The slow beat of the music and the whimsical tone of the notes make the Bunny Hop clearly aimed towards children. Although it may be seen as a kids' dance, children have much more fun with it when people of all ages join them on the floor. Before starting the steps, it is important to get everybody lined up on the dance floor. The Bunny Hop is done by taking steps to the side and then hopping like bunnies. The idea is that a whole line of dancers, each one with his hands on the waist (or shoulders) of the person directly in front of him in line, moves around the dance floor, following the person who is at the very front of the line. Make sure that if a lot of children are participating, there are adults in between to keep things moving smoothly, and make sure that the people who know the steps and rhythm very well are evenly spread throughout the line. The steps to this dance are incredibly simple. Even if you don't know the steps before it starts, simply tag yourself onto the end of the line, and by the end of the song, you will be a champion Bunny Hop dancer. Place your right foot out to the side, but don't put your weight on it, then bring it back next to your left foot. Repeat this action a second time. Place your left foot out to the side, but don't put your weight on it, then bring it back next to your right foot. Repeat this action a second time. Now take a small hop forwards, and pause for one beat. Then hop backwards, and pause for one beat. Lastly, take three successive hops forwards, without pausing in between. If you need some visual aid in learning these steps, check out this bunny hop dance YouTube video. Like country line dancing, the Bunny Hop is great fun for social dance occasions. One of the great benefits of the Bunny Hop is that it is simpler to learn than most line dances, and it appeals to the child in people of all ages. Like the Chicken Dance, the Bunny Hop is a common wedding line dance, but add this dance into any occasion for some carefree fun for people of all talent levels and all ages.